It’s all about confidence…everything else is just details. 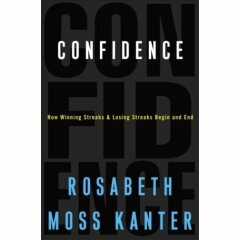 The book Confidence: How Winning Streaks and Losing Streaks Begin and End by Rosabeth Moss Kanter is, without question, one of the most influential books on my career as an educator. Kanter is not an education writer per se – she is a professor at the Harvard Business School – however, her work helped me realize that confidence is the key that unlocks the door to maximizing student success. In Confidence, Kanter explores the issues of winning streaks and losing streaks. She highlights various organizations, sports teams, and individuals who consistently win and those who consistently lose. Why is it that some companies, regardless of economic instability over long periods of time, continue to succeed? What are the conditions within a professional sports organization that allow teams to remain at the top? What is the mindset of individuals that brings them to place where they expect to succeed? Why can’t some companies, teams, or individuals halt their losing streaks? The expectation about the likelihood of eventual success determines the amount of effort people are willing to put in. Those who are convinced they can be successful…who have ‘self-efficacy’…are likely to try harder and to persist longer when they face obstacles. Think about that for a moment. If our students are convinced they can be successful – if they have the self-efficacy – they are likely to try harder and persist longer when they face obstacles. Confident students believe they can eventually learn anything. They will try harder and persist longer because they have what Kanter calls a grounded optimism; their confidence is based upon a track record of success and not simply an inflated level of false hope. As a parent, I vividly remember the time when my children learned to ski. At the time, my son was 5 and my daughter was 8…and they were both terrified. They didn’t think they could do it, thought they might get hurt, and thought the “learning hill” was too steep. Now the learning hill was not really even the real learning hill – it was a path with a very gentle slope – but they were convinced it was a double black diamond!! Just prior to meeting their instructor, I huddled my kids together and I reminded them of their past successes. I said to my daughter, you used to be afraid to ride your bike without training wheels; I turned to my son, you used to be afraid to put your head underwater. As I continued to remind them of all of the other fears they had overcome I could see their confidence growing. We turned and looked up the mountain to the hundreds of skiers enjoying the day and I said, Look at all of those people who have learned how to ski…I bet they were once afraid too, but look at them now…why would you be any different from them? If they can do it, so can you! The connection to the classroom wasn’t immediate, but that day convinced me that grounded optimism solidifies a child’s (student’s) confidence to stretch beyond their comfort zone. The opposite of confidence, of course, is anxiety. As most of us know, anxiety interferes with memory, attention, and concentration. Anxious students prefer to have information fed to them as they have a general sense of incompetence. In turn, this decreases the incentive to learn and begins a downward spiral: Passive students don’t internalize the learning which leads to a poor performance. The poor performance reinforces the feeling of incompetence, which further decreases the incentive to learn, which leads to a greater desire to have the material fed to them, and so on. Anxiety is counter-productive to learning and we need to find ways to minimize its impact. …at the beginning of every winning streak there is a leader who creates the foundation for confidence that permits unexpected people to achieve high levels of performance. As the leader in the classroom, the teacher creates the conditions for success and the foundation for confidence which allows unexpected students to achieve high levels of performance. Leaders within our system do the same for the adults they lead. When we have the confidence mindset, we see everything through a different lens. We begin to ask ourselves some tough questions about the way we’ve always done it. If something we’ve always done raises anxiety we need to consider whether it is producing the desired results or whether it is standing in the way of success. All of the structures, routines, and practices create the learning condition within the classroom; the question is whether the condition created will build the students confidence to a level where they expect to succeed. It’s not that they won’t have to work at; they just know that success will be the end result. Confidence transcends any skill and any century. Teaching is, and always will be, about building confidence…confidence is about expecting a positive result…expecting a positive result drives the desire to learn. Everything else is just details. This is a great blog! I love the idea of “grounded optimism” and the fact that we as teachers and leaders set the conditions so that our students can become convinced to expect success. This ties in so well with the fact that we construct the learning experiences for our students that encourage success – and then connect that to assessment that really helps our kids to demonstrate success. I will be continuing to read your blog and look forward to learning more! I’ve just ventured into this, as well – and into the world of Twitter, as well. Thanks Gloria. I really beleive that when we come at education from the confidence mindset, we will do everything – assess, instruct, and grade – through a different lens. The confidence paradigm for me filters everything I do. I think your blog looks very interesting…documenting your journey, very brave!! I look forward to future conversations! Tom, I have seen it time and time again in the classroom. Kids will come in in September and they have been on a losing streak since they have started school, but dedicated professionals who take the time to get to know the kids and invest in them can break the streak. Once kids start “winning” their confidence grows and they begin to believe they can learn. Once they have the confidence, their whole paragdigm shifts. Tom Guskey talks about starting the year on winning streaks and building on early successes. It is so true. Couldn’t agree more, Darcy. I think the key is how we and our students repsond to a “loss.” It is unrealistic for kids not to experience a set back, but their level of confidence determines their level of resiliancy. I think it was Mike Krzyzewski who once said that the key to avoiding a losing streak is to never lose twice in a row! Simple, yet profound. When our students experience a “loss” we have to respond immediately so that the losing streak mindset doesn’t kick in. Setting kids up for immedite success (not lower standards) at the beginning of the year is huge! I remember Guskey talking about a new year bringing new clothes, a new haircut, and maybe new friends…but does it also bring a new level of success or confidence? An outstanding post, Tom. There are many thoughts that come to mind when I read this post, but for some odd reason I think about students with math. I sincerely believe that if we instill confidence in students about their math abilities from a very early age and develop that self-efficacy, they will be successful in Math. Yet often times, we perpetuate the myth (and it is a MYTH) that there are people that can do math and people who cannot. I think the same can be said for educators and technology. Too often I hear people say “I am not a techie”, or conversely, they will say to me, “Well that is easy because you are a techie”. I am not a techie, but I have put some effort into working with technologies that I believe allow me to be a better learner. Again, it really is just about instilling that confidence that teachers can become tech savvy: I just thought I could do it. We need to work on that confidence with our teachers and our educators: thanks for the reminder! I totally concur with Cale’s comment on math – Do you ever hear a parent or student proudly annouce that they can’t read? But with math it’s OK. When I taught math at the middle school level, I told kids it was my job to show them that they were good at math. Once I convinced them they could do it (through constant encouragement, feedback, and multiple ways of understanding), guess what, they could! Excellent goods from you, man. I’ve be aware your stuff prior to and you’re just too great. and you still care for to keep it smart. I can not wait to learn far more from you.